The table below highlights that SMH almost doubled the performance of the S&P 500 since the 2009 lows. Softness this year has SMH testing rising support and this year’s lows at (1) above. Joe Friday Just The Facts– This leading sector is facing a very important support test at this time! A bounce is due as momentum is now reaching oversold levels. 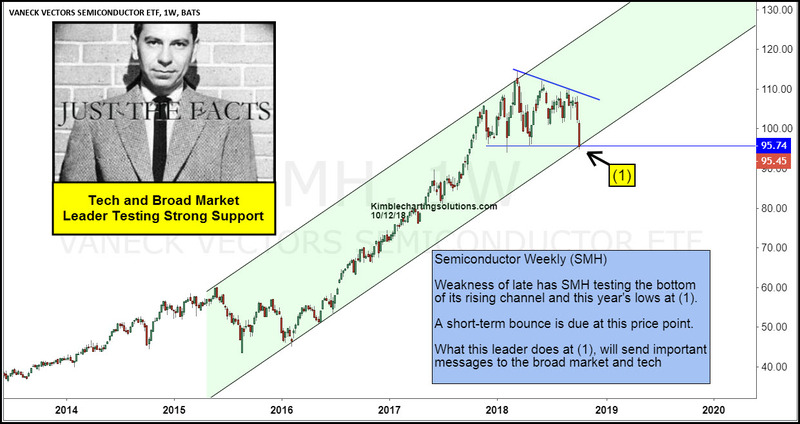 The long-term bull trend would receive a concerning message from SMH if it breaks support a few weeks from now. Keep your eye on tech leadership at this key price point friends. In time we feel what they do at (1), will send a very an important long-term message to the broad market and the tech sector. The VanEck Vectors Semiconductor ETF (SMH) was unchanged in premarket trading Monday. Year-to-date, SMH has declined -0.48%, versus a 3.82% rise in the benchmark S&P 500 index during the same period.